Our premium quality laminating pouches provide outstanding results. 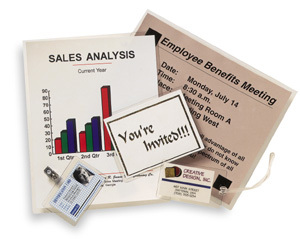 These laminating pouches preserve and enhance printed material with a clear plastic coating. Our pouches are easy to use and pre-sized so there is no need for trimming. The laminating pouches are sealed on one side -- Just slide your document into the pouch and you are ready to start laminating. If you are looking for a specific size laminating pouch please contact us and we will be glad to assist you. Contact us at 1-800-443-7557. LAMINATING POUCHES LETTER SIZE 9” X 11 1/2"
Laminating Letter Size 9'' X 11 1/2'' for 8 1/2'' X 11'' Inserts. These Laminating Pouches have a high-quality Matte Finish on both sides. Available in Letter and Double Letter Size, in a variety of thicknesses. Cuts down on glare making them great for Menus and Photos. Now you can create your own custom magnets quickly and easily with magnetic pouches. Simply place your printed paper or photograph between the laminating film and the magnetic backing. Insert the closed end of magnetic pouch into a pouch laminator. These magnetic pouches are designed for use with pouch laminators that have heated rollers. These pouches are great for refrigerator magnets, file cabinets, car door magnets and more! MAGNETIC POUCHES are 3mil laminating film and 30 mil magnet. We offer a wide selection of I.D. size laminating pouches which are perfect for Badges, Tags, Licenses, Bookmarks, Luggage Tags and more. We also offer 6'' x 9'' photo size laminating pouches great for small photos. These pouches are easy to use and provide crystal clear laminations. Click on ID SUPPLIES to see our selection of ID accessories. We offer slot punches that allow you to punch a slot into your laminated cards to attach clips, straps, lanyards and more . Our large size pouch laminating carriers offer a release coating that enables you to take the laminated pouch out of the carrier easily.